Criminalize Conservatism: Republicans Aren't All Racists, Are They? Republicans Aren't All Racists, Are They? "House Majority Whip Steve Scalise Spoke At White Supremacist Conference In 2002." "Twelve years before he was elected by his colleagues as House majority whip, Rep. Steve Scalise (R-La.) spoke at a conference hosted by the white supremacist group European-American Unity and Rights Organization. "According to another Stormfront post, the National/International EURO Workshop on Civil Rights was held from May 17 to 18, 2002, at the Landmark/Best Western Hotel in Metairie, Louisiana. The conference was also listed on an Anti-Defamation League list of extremist events for that year..."
Of course little Stevie isn't just another David Duke - or is he? "Majority Whip Steve Scalise Struggles To Distance Himself From David Duke." "WASHINGTON -- House Majority Whip Steve Scalise (R-La. ), whose office has been beating back criticism about a speech he gave at a 2002 gathering hosted by a white supremacist group, received some ill-timed praise from the group's founder Monday evening. The notorious former Ku Klux Klan leader David Duke described Scalise as 'a fine family man' with whom he often agrees. "For his part, Scalise's office has said he was unaware of the white supremacist group's views when as a state lawmaker, he spoke at the 2002 conference. But in 1999, then-state Rep. Scalise told a Washington newspaper that he agreed with many of Duke's 'conservative' views..."
...because Stevie SAYS he isn't a bigot, and he doesn't support anything he read about himself! "Steve Scalise: 'I detest any kind of hate group.'" "Louisiana Rep. Steve Scalise said he doesn't support 'any of the things I read about' a white supremacist group that organized an event at which Scalise appeared in 2002. "In an exclusive interview Monday with NOLA.com | The Times-Picayune about the growing controversy over his appearance at the Metairie event, Scalise said it is ridiculous to suggest he was involved with the group, which was created by former Ku Klux Klan leader David Duke. "'I didn't know who all of these groups were and I detest any kind of hate group. For anyone to suggest that I was involved with a group like that is insulting and ludicrous,' Scalise said. "The congressman -- who was a state representative 12 years ago -- said he doesn't remember speaking at the event, but that he talked to several civic groups and other organizations throughout the state about his opposition to the Stelly tax plan that spring..."
So I think we should give him the benefit of the...whoops! Of course racism isn't dead in Dixieland according to the Fascist Five in the Supreme Court, but the last time we checked, Louisiana was south of the Mason-Dixon line. Conservatives have two constituencies that they can count on to march in lockstep to the polls: Rightwing evangelicals and racists, the two dumbest constituencies that money can buy - and the GOP leadership knows it! When Conservatism is criminalized, the racists and evangelicals will probably stay home and let the rest of us vote for candidates who can HELP democracy, not hinder it. 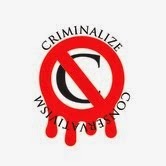 Let's give criminalization a chance. "Blacks Bought A Lot Of Propaganda On The Liberal Plantation."